A vinyl pergola is an ideal choice for adding long-lasting beauty and charm to your tropical garden or landscape. It is a low-maintenance structure that can be used in the garden or landscape in a variety of ways. Vinyl pergolas are available in many different styles. They can be square, circular, or triangular (to fit into corners) in shape. Some even have arched or gabled rafters. 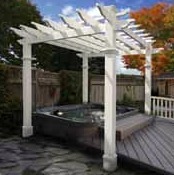 Pergola kits can be purchased online or through home improvement stores. Custom designs are also available. Note: Before purchasing and installing a pergola kit, be sure to check with your local building authority and home owner association for specific requirements and / or restrictions. Vinyl pergolas are available in a variety of shapes, styles, and colors. While the most common color is white, you can also find shades in light tan and oyster. They are textured to mimic the look and feel of wood grain. They are durable and not susceptible to insects and rot (unlike wooden pergolas). They will not crack, split, warp or peel like wood, or corrode like metal pergolas. They can be matched to complement other garden and landscape structures to unify overall design (benches, arbors, garden arches, gazebos, or planters). They are available in many different styles and custom designs are available. They can be square, circular, or triangular (to fit into corners) in shape. Some even have arched or gabled rafters. Many kits are easy to install, and require minimal assembly and maintenance. You can keep them clean by simply wiping them down with a soapy towel and rinsing with clean water.